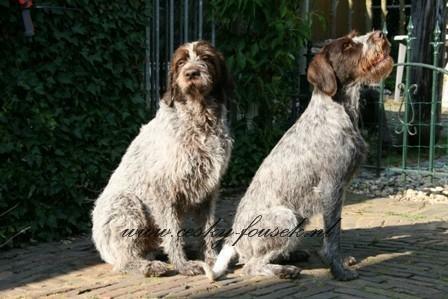 The Cesky fousek or Bohemian wirehaired pointer is the only Czech gundogbreed recognized by the FCI. It is certain that history of the breed goes back to the early Middle Ages, to be precise to the 14th century. In the 14th century Vilém Zajíc Valdek, teacher of Emperor Charles IV (1316-1378) wrote in “veci jagermisterske” the following: In 1348, Margrave Ludwig of Brandenburg received some dogs as a gift from Emperor Charles IV for the practice of hunting. These dogs were called Canis Bohemicus. This document has been preserved and is located in the castle Karlstejn. It is the oldest document found on the history of the Bohemian wirehaired pointing griffon. Three centuries later, in 1679, Bohuslav Balbín published his script “Miscellania Historica regni Bohemiae”, in which he speaks of the famous Czech hounds in the chapter entitled ‘Canes in Bohemia venaticus laudatiffimi “. These dogs are known for their speed, tenacity, focus and endurance. Because of these hunting qualities the popularity of the Czech dog begins to reach beyond the Czech border. Since no other wirehaired pointing breeds were known in this period, it may be assumed that the Canis Bohemicus stands at the basis of the group of wirehaired Pointing Dogs. In 1882 Josef Černý Vilém, a forester from Beroun, published his book “Myslivosť – příručná kniha”. This is the first detailed description of the Czech gundogbreed. The first Czech kennel club dedicated to the Czech gundog breed was founded in 1896 and the breed got its current name Cesky Fousek. Because of the political circumstances of that time, the association can no longer continue. In 1924, the breeders’ association is relaunched, and a begin is made to rebuild the breed. Very stringent requirements were put to the breeding dogs: only dogs with proven qualities were used for breeding. The dogs used to breed were remaining typical Cesky Fouseks, and in addition there were other pointing breeds, like the German wirehaired and shorthaired pointer. 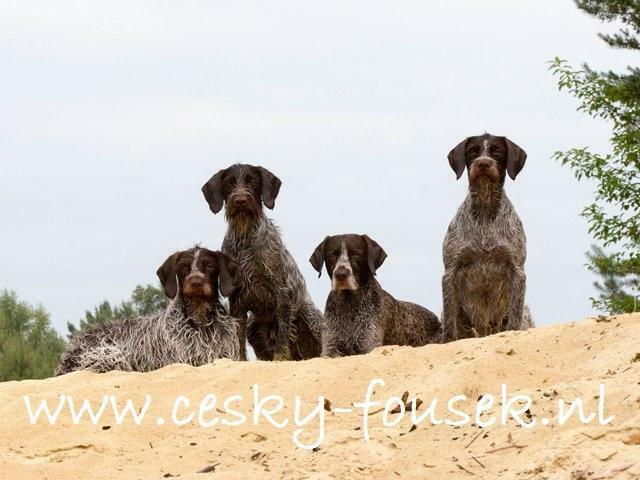 The first modern breed standard for the Cesky Fousek was published in 1931. And in 1944, the Cesky Fousek was included in the CLP, Czech Pedigree Book. In 1958, the Czech breed club was renamed and given her current name. Regional boards were established to manage the breeding. The Pedigree book was closed en with it the injection of foreign blood ended. Josef Kuhn began to gather documentation for the approval of the Cesky Fousek by the FCI. Thanks to the work of MVDr. Josef Kuhn and the support of Ing. Václav Růžičky, chairman of the FCI from 1964 tot 1965, the Cesky Fousek was recognized by the FCI on May 21, 1963. It was probably in the 1970s that the first Cesky Fousek lived in the Netherlands, but in 1989 the first litter of Cesky fousek puppies was born in the Netherlands. In 1990 the World Exhibition was in Brno, and with it the development of the breed in the Netherlands accelerated. A number of females was imported and later used for breeding. On December 16, 1994 the Cesky Fousek Vereniging Nederland was founded. The association started out small, and for a long period the Cesky Fousek remained an unknown dogbreed. Over the years the Cesky Fousek has become more popular, but the number in the Netherlands is still small. Owners of the breed do not see this as a disadvantage, because popularity has never benefited a breed! Height Males 60-66 cm weighing between 28 and 34 kg. Height Females 58-62 cm with a weight between 22 and 28 kg. – A certain amount of bristly hair, 5 – 7 cm 7 cm long, very straight and coarse, especially in the chest, back, groin and shoulders. – Dark roan with or without brown patches. – Brown with ticked markings on fore chest and lower part of the limbs. – Brown without any markings. The color roan is the original color of the Cesky Fousek. It was after the reconstruction of the breed that the variety of the color brown was recognized. To keep the Cesky Fousek coat in a good condition, it is recommended to pluck the dog once or twice a year. The Bohemian wirehaired pointer is a smart, focused and faithful dog. It is a hard worker with a great willingness to cooperate. Although the dog has got a great passion of hunting, he will always keeps an eye at his master. The Bohemian wirehaired pointer does not spare himself, but has a very sensible character towards his master. It’s a dog that is very sensitive to the moods of its master, and usually the dog doesn’t need to be treated harsh.